a gorgeous litter of 10 f1b Newfiedoodle puppies born December 1st. Based on their 72 pound Newfiedoodle mom and 74 pound standard Poodle dad, we expect this litter of puppies to be 60-80 pounds full grown; this is a little smaller than most of our Newfiedoodle litters. These f1b Newfypoo puppies are incredibly sweet and get along with everyone they meet! We believe they will make outstanding family members for a few fortunate forever homes. Cocoa is a cuddly little girl with a love for life. She has a gorgeous chocolate and white coat that has just the right amount of wave to it. Cocoa is loving, cheerful, sweet and will make a wonderful addition to any forever home! Cherri is a cute little puppy with a great personality! She loves attention and would be perfectly fine being held and petted all day. Cherri has a gorgeous curly coat with beautiful black markings. She is very smart as well, and we think that she will be easy to train! 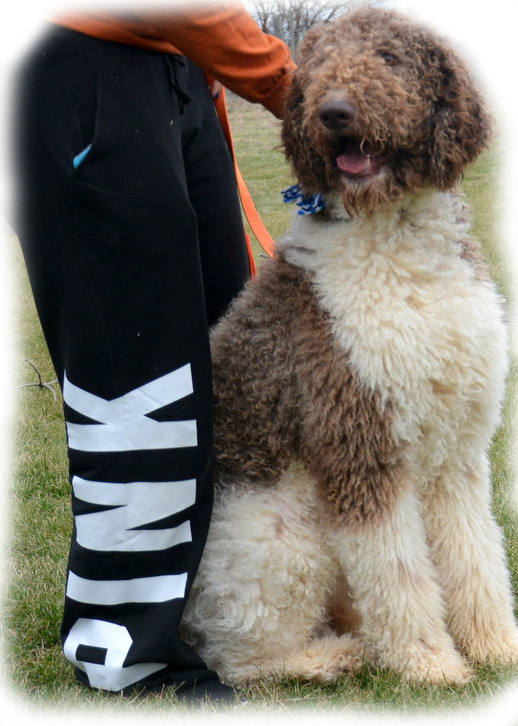 Camilla is a chocolate and white Newfiedoodle with a thick, wavy/curly coat and a cute white blaze on her face. She has been so much fun for us to raise, and we think that she will adjust well to any forever home. Camilla is happy, beautiful, and loving! Charisma is an adorable little Newfiedoodle girl with a lovely chocolate and white coat and captivating blue eyes. She loves running around the yard and playing with her siblings. Charisma has such a fun personality and will endear herself to you in about 5 seconds flat. She will make a wonderful companion! Celia is a beautiful Newfiedoodle with a glossy black and white coat. She is a social little girl who loves people! She loves to be held or played with and is super affectionate. She has been so much fun to raise and effortlessly became a member of the family! Cinderella is a gorgeous Newfiedoodle with a thick, wavy black coat with white markings. She is our little princess and gets along with everyone she meets! Cinderella is beautiful both inside and out and will be a fantastic furry companion! Colt is a cute black and white Newfiedoodle with a thick, wavy coat. He is a very happy little guy with with a contagious love for life. We are sure that Colt will make a wonderful furry family member for years to come! Corby is a handsome little guy with a black and white, thick, wavy/curly coat. He will certainly turn heads on walks through the neighborhood! He is a sweet puppy with a deep love and loyalty to his family. We will miss Corby, but we are excited to match him with his forever home. Cyrus is a wonderful, little puppy that loves his siblings and his family. He has a gorgeous black and white coat and deep, intelligent eyes. He always brings a smile to our faces! Cyrus is very loving, happy and super loyal to his family. Chaco is a black and white Newfiedoodle with a curly coat and a super cute face. His handsome coat and friendly personality will receive many compliments as he gets older. He loves to please us, and is always making us smile!